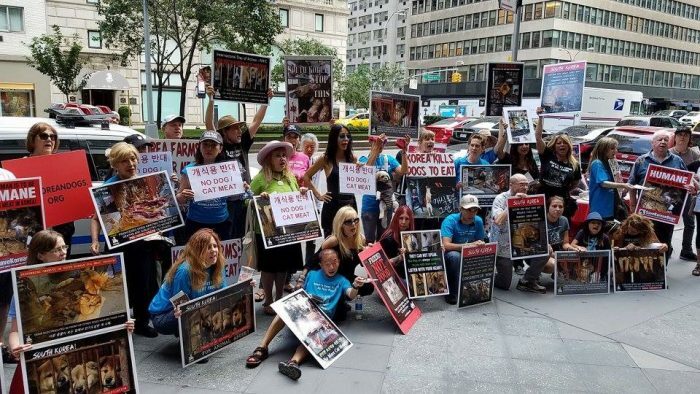 We are very excited that the New York based animal rights group “The Animals’ Battalion” will be organizing demonstrations in front of the Korean Consulate General’s Office for the fourth year in a row for the 3 days of Boknal (dog eating is traditionalized in Korea – Chobok 7/17, Joongbok 7/27, and Malbok 8/16 in 2018) and EVERYONE IS INVITED. YOU DON’T HAVE TO BE A MEMBER OF THE ANIMALS’ BATTALION. IF YOU CARE ABOUT THE KOREAN DOGS, PLEASE JOIN. They held 3 demonstrations in the previous three years at the same location and were covered by ABC network news in New York and also South Korea. The third day of 3 demonstrations in 2016 and 2017, they had a big breakthrough. Not only did Consulate General Ghee-Whan Kim in New York acknowledge them, but he also promised to deliver their message to the Korean government. Click HERE to see the photos from their events in the last 3 years. The dates for this year’s demonstrations are Chobok 7/17/2018 Tuesday, 7/30/2018 Monday (changed from Joongbok 7/27/2018 due to weather condition) and Malbok 8/16/2018 Thursday. 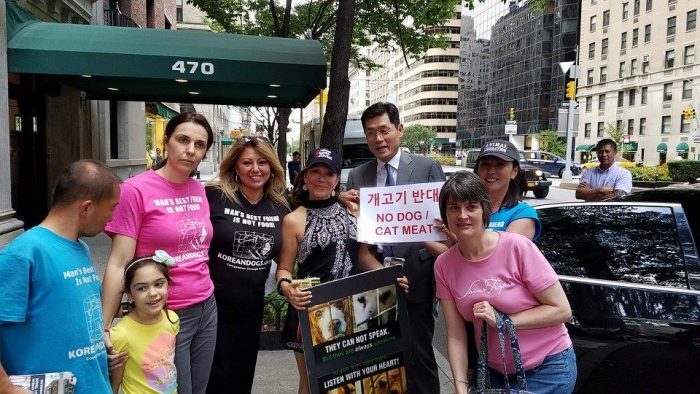 The Animals’ Battalion Demonstration on August 11, 2017 at the Korean Consulate General’s Office in New York. Photo: The Animals’ Battalion. Never give up fighting for Animals. YES!!!!!! NEVER GIVE UP FIGHTING FOR ANIMALS!!!! TOGETHER WE WILL CHANGE THE WORLD, AND WE CAN BE BETTER HUMAN BEINGS!!! It’s been going on too long and it’s still on!! We are going to stop for real this time!! Yes!! Yes! We have to fight until this outrageous behavior stop!! THESE DISGUSTING GLUTTON PEOPLE MAKE EXCUSE THAT IT’S CULTURAL —NOTHING CULTURAL IN THIS MODERN WORLD–THE GOVT. OF KOREA AND ALL COUNTRIES MUST ARREST AND JAIL ALL PEOPLE WHO EAT DOGS/CATS LIKE THEY DO IN TAIWAN–THE PEOPLE OF THIS WORLD IS FIGHTING TO SAVE ALL DOGS/CATS LIVES AND THESE EVIL MANKIND MUST STOP THIS MURDER OF LOYAL DOGS/CATS–ALL DOGS/CATS ARE THE SAME WITH EMOTIONS AND SENTIENT BEINGS. Animals and SHOULD NEVER BE TORTURED, ABUSED AND SADLY EATEN. custom and practice and DOG-EATING MUST BE ERADICATED WHEREVER IT IS FOUND. God bless all who speak up for the innocent! RESPECT LIFE. EVERY LIFE. Thank you, all the people who (try to) make this world a better place for ALL. SHAME ON THE HUMAN WHO IS EATING HIS BEST FRIEND !!!!!!!!!!!!!!!!! God bless the poor suffering animals. Bless the people who fight for them. Shame on those who think it is just to act in such away and consider themselves educated. How can humans be so evil? Praying for these animals and the beautiful & selfless activists who stand up for them!! You are truly an inspiration! La lucha por los derechos de los animales tiene que seguir creciendo. Together we can stop the cruelty to animals!!! Em pleno século 21 o ser humano ainda continua vivendo como se fosse um homem das cavernas ,chega de agir como besta ,somos seres conscientes e lúcidos !!! Everyone rise against dog and cat meat trade in Asian countries. This horror has to Stop! Stop the dog and cat consumption in Asia. They are our friends. We are very sorry that you and your friends weren’t notified of the event date change. I notice you are on our newsletter mailing list. We should have sent out a newsletter with the change in date when were were notified of date change on Wednesday from the Animals’s Battalion. We apologize and will do our best to send out a newsletter if event date changes in the future. Thank you so much for caring!! I thank you all for who are fighting to save these beautiful animals ,keep speaking up for them, their is no need for these people to do this inhumane and tourture, they cant speak and tell you all the pain they feel .